Does Damp Affect the Sale Price of My House? Go Compare recently posted some very interesting survey results. They listed all the most common reasons why potential home buyers would be put off from making an offer, when viewing a property. The top reason given in the survey, by some margin, was “Damp patches, stained walls and ceilings”. 70% of people, who took part in the survey, said that this would stop them from buying. In fact, three of the top five answers were related to damp issues or their side effects. You can read the full article here. This means that, if you’re experiencing damp problems that are immediately identifiable on the first viewing, 70% of your potential buyers would be immediately discouraged from making an offer. Those that would make an offer would still have to consider things carefully, after the customary survey had been performed and the costs to rectify such problems assessed. If you’re planning to sell your house but it has either visible damp patches inside or mould growth, brought on by condensation, then those problems could dramatically reduce the sale price of your home. It is best to fix any damp problems you may have, as the money spent will more than likely be less than the amount you will gain in the final sale price, not to mention the amount of time and stress saved as a result. So, how does this relate to Stormdry? Well, the majority of damp issues experienced by the home owner either relate to penetrating damp or condensation. 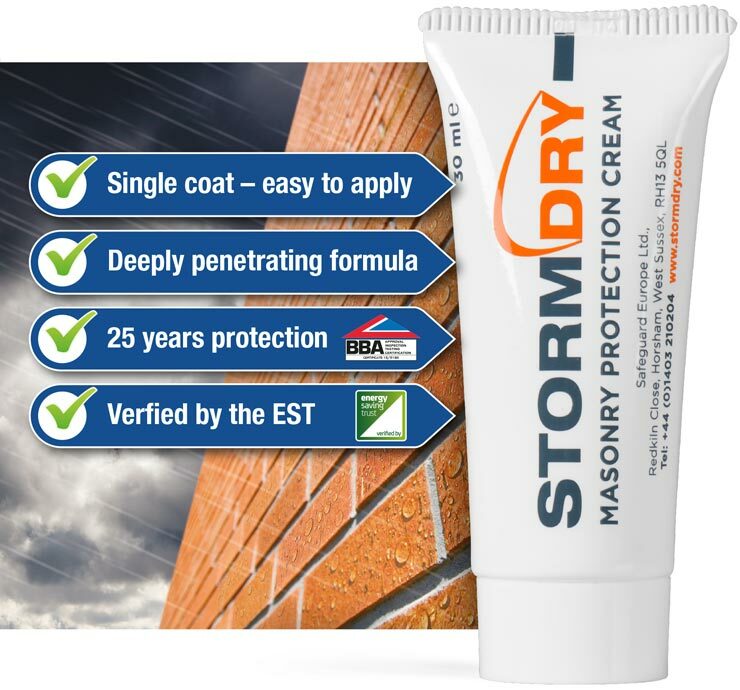 Stormdry has been proven to effectively help treat these issues, both of which can be highly interconnected. The good news is that Stormdry is a quick and cost effective way of dealing with damp issues properly. Penetrating damp is where water manages to penetrate through a wall, either due to the porosity of the building materials or due to defects on the exterior, such as cracks, letting water in. The resulting damp patches can be unsightly and can eventually cause structural problems. 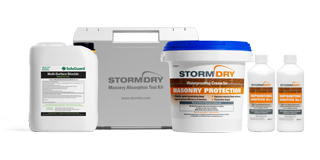 Stormdry was designed to stop water from penetrating through bricks and masonry and, as long as any cracks or defects to the surface that it’s being applied to are fixed, will eliminate penetrating damp after application. The source of any penetrating damp, however, can sometimes be difficult to diagnose and repointing is often required. It is best to seek the advice of a professional if you are unsure of the source of your damp issues. Condensation, and the resulting mould growth, is one of the most common problems faced by the homeowner today. Mould is unsightly, produces unwanted smells, ruins clothes and many people are concerned about the potential health hazards of continuous exposure to it. Most people are unsure of how to deal with condensation and and there is a perception is that it’s very difficult to combat. Sight of mould or condensation during a viewing could be an instant turn-off to a potential house buyer. In the increasingly wet weather that the UK is experiencing every year, the average home now has wetter and, consequently, colder walls. Buildings are also more air tight than they used to be and the rising costs of gas and electricity are forcing people to be more careful about their heating use. People are producing moisture at the same rate they always have but are perhaps more reluctant to spend money on expensive heating bills and less likely to ventilate their properties by opening windows. All these contributing factors mean that the moisture in the colder air of a property has nowhere to be vented to and is deposited as condensation on the coldest surfaces. Stormdry can help combat condensation by stopping water from penetrating into any weather facing walls, Stormdry stops the cooling effect of evaporation and increases their temperature in wet weather. Condensation is far less likely to appear on a warmer surface, such as a Stormdry treated wall. By treating your property with Stormdry and presenting potential buyers with a warm, dry, and damp-free environment, you are instantly regaining the interest of the 70% of people that would have previously been discouraged from making an offer. It doesn’t require time-consuming and costly re-plastering on the interior or for any construction work to take place. Just one coat of Stormdry with a paint brush or roller is all that’s required to treat an otherwise good condition brick or masonry wall. 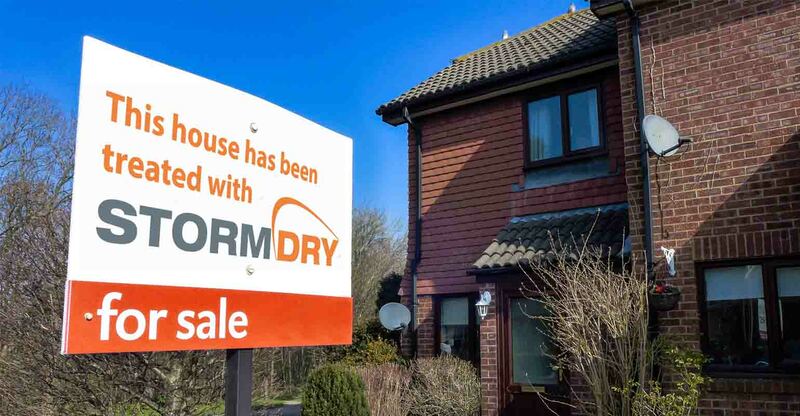 For a non-disruptive and effective method of ensuring that you are presenting your home to buyers in the best possible way, Stormdry is an ideal solution. We always recommend that you give our technical department a call for details of coverage, price and the appropriateness of treatment. Our qualified technical advisors will be able to help you solve any damp issues that you may have. Call us on 01403 220130.